Yesterday a girlfriend and fellow chef, Melissa and I attended the City Harvest Sizzling Summer Garden Party to celebrate all fellow volunteers. If you are not familiar with City Harvest, it is a large non profit that helps feed and educate America about forming healthy eating lifestyles. 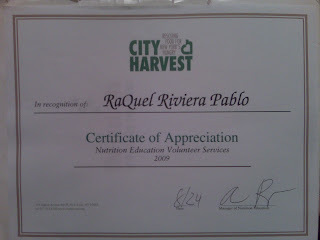 There are various programs within City Harvest. The one that I am closely connected to involves serving as a chef instructor, moreover the In the Mix program which teaches hands-on culinary and pastry cooking lessons to high school students (in my case from the Food & Finance School in NYC) who are interested and passionate about pursuing a cooking profession. There are numerous programs that exist, those that teach young children, the elderly, families, those that provide demos in convenient stores etc, but the underlying purpose is to spread the importance of eating healthy, fresh, and local ingredients rather than succumbing to the fast food chains and other unhealthy or empty nutritional value foods that exist among us. It was an honor to be invited to celebrate our work, but moreover the work and success of the program. We each were given an award to commemorate our actions. While this was wonderful, the real reward was being among other instrumental chefs, nutritionists and volunteers who are all equally passionate about cooking, but more importantly, about making a difference in teaching people how to make the most of the ingredients available in their communities regardless to education or income. So my award above is not only for me, but for the lives I may have impacted and the many more I hope to reach. Thank you Nancy for making your beautiful garden available and for Aliyah and all the main coordinators for reaching out and welcoming us. To many more years or making an impact! Catherine Zeta Jones plays a classical chef in the movie No Reservations who after inheriting her niece and feeling threatened at work after having to deal with a lose, relaxed chef--played by Aaron Eckhart--eventually falls in love and lives more or less, happily ever after. The restaurant in the movie actually exist similarly to the diner in When Harry Met Sally. I am sure a ton of other movies come to mind. 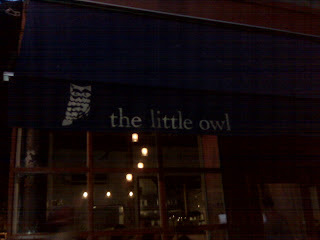 Well, this week my husband and I visited The Little Owl. Fortunately, if you are willing to wait you can get a seat without reservations. This option was our only ticket in! After a bit of a wait, we were seated and told of the specials of the night. As the traditionalist that I am, I aim for the classics, or the items on the menu that are most raved about. For apps, the Meatball Sliders sounded amazing, and trust me after adding a little bit of Maldon salt (which is discretely placed on a small plate on your table) the meatballs were perfect way of starting the evening. We then ordered Crispy Chicken and Alex, The Pork Chop. 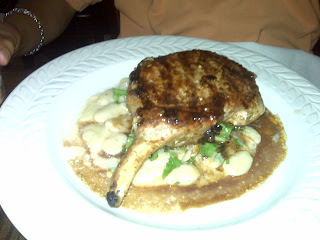 Naturally, we tasted each others plate and I was taken aback by the pork chop it was AMAZING! Don't get me wrong, the chicken was delicious, crispy outside and juicy, flavorful inside and definitely a great portion, but something about the pork chop blew me away. Room for dessert?--No, not really. Instead we finished our bottle of rose and asked for the check--which btw is presented in a actual book as opposed to the black vinyl credit card book you get in 98% of other establishments. A nice touch I must say. I love when places are featured in movies, shows and documentaries, otherwise little gems like The Little Owl would remain a little secret. 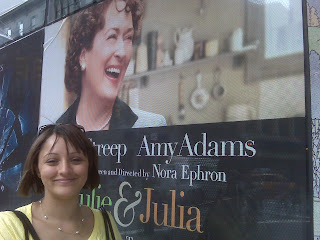 Meryl Streep did a marvelous job impersonating Julia Child. Her look, her voice, her body language and her laugh matched the flare and quirkiness of the one and only Julia that millions have grown to love. As I watched the movie I thought of the similarities I shared with both women: The fact that both held office jobs and led a "secret" life. The fact both searched for something that would give them purpose, although it was right under their nose. The fact that they both jumped into something wholeheartedly, worrying about the aftereffects only after they committed. The fact that they both went through a period of uncertainty, but kept striving after what they believed in. And the fact that they showed how the common person could easily prepare delicious meals--that may seem difficult--after "mastering" french techniques. At the end of the movie my heart glowed with warmth and my face with a few tears. Trust me, I know I made the right decision leaving my job to pursue cooking. And I know that so long as I continue to put my heart in all that I do I will make an impact regardless to how big a small--an impact nonetheless. The movie for some may be mere entertainment, for others a chance to get a glimpse of the life of an icon, for me it was motivational. 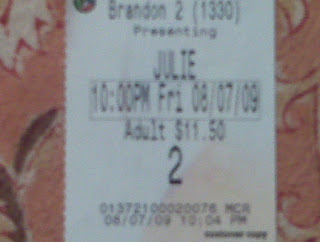 If you get the chance, definitely go see Julie & Julia it will open your mind and hearts to a passion that we should all relate to, whether it be of food or what ever strikes your fancy. You never know it may even inspire you to prepare your own Boeuf Bouginon or debone a duck. Either way it is definitely worth your while. Go and enjoy! Bon Appetit! Summer is quickly leaving us, and to be honest I really didn't find it to be much of a summer. We mostly got stuck with rain. So when the BBQ my aunt planned landed one dry Saturday we were thrilled, although the humidity was unbelievable! The party would consist of my husband, my mom-in-law, a cousin of mine, my aunt, two dear friends and my immediate family from CT which was great since they haven't visited NY for 2 years. My aunt as the hostess was taking care of the basics, the hot dogs, the burgers, potato salad, macaroni salad and the BBQ chicken. But naturally I thought of bringing something to help ease her load. So after coming from work at the YCA, Alex and I drove to a market picked up the ingredients and I was off to cook in time for the 2pm BBQ! I decided to make Buffalo Wings and a Blue Cheese Dressing as everyone in my immediate family loves them, A Bean Salad which my mom loves, and a Family Style Crudite platter with a Sun Dried Tomato Dip for the "I am eating like a pig....let me munch on something healthy" eaters. All 3 platters were a hit! Not to mention that our dear friend Nick also prepared a platter of mussels with garlic and a Filipino version of bacalitos-shrimp fritters! Confession: These platters all left before my mom--who was running extremely late--arrived. Although I did reserve her some wings and salad. Fortunately, there was plenty of food to go around. In fact, the basic BBQ staples--hot dogs and burgers--only made it to the grill after 11pm. We all had a fantastic time stuffing our faces, chatting, laughing and well...stuffing our faces some more! Hopefully the remaining of summer treats us good, because I am sure we can all use another day of feasting with family in the heat!! !